Being self-sufficient in everyday life contributes to a person’s confidence and self-esteem. Occupational therapists – also called OTs – help people develop…recover… and improve their self-sufficiency and the ability to enjoy work and daily activities…more fully. Patients typically seek out the help of OTs due to disability, illness, injury, or mental health issues. They help patients with daily life activities such as feeding themselves, getting ready for work without assistance, using public transportation, and participating in school. OTs work with their patients to identify goals for treatment, then create treatment plans to reach them. Occupational therapists evaluate patients’ homes and workplaces to find ways to better prepare the environment for their needs; for example, labeling cabinets or removing fall hazards. They often educate a patient’s family and employer about how to accommodate the person’s needs, and document patients’ progress throughout the treatment. These therapists work at hospitals, clinics, schools, and nursing homes. They spend a lot of time on their feet, and may lift or move patients. Many travel to meet patients in different settings, and may work evenings and weekends. Being supportive and enthusiastic are important personal qualities for OTs. A master’s degree and a license are required to enter the field; though some positions require a doctoral-level degree. 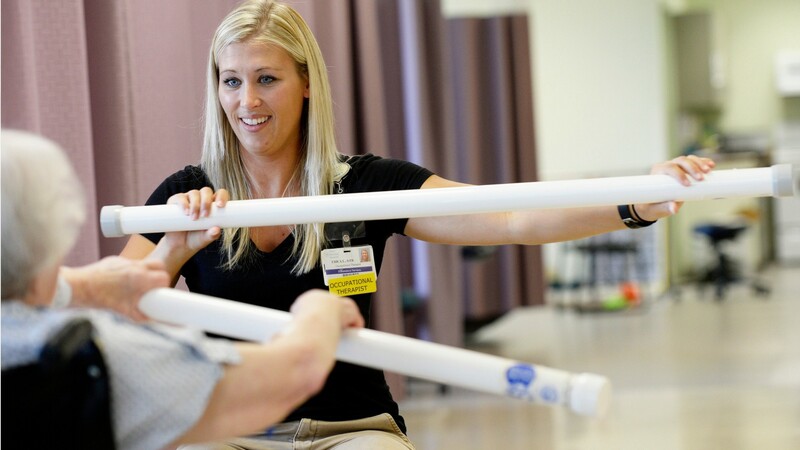 Occupational therapy is often a demanding career, but it’s one that offers a rich reward— helping people lead more active and independent lives. Assess, plan, organize, and participate in rehabilitative programs that help build or restore vocational, homemaking, and daily living skills, as well as general independence, to persons with disabilities or developmental delays. Complete and maintain necessary records. Test and evaluate patients' physical and mental abilities and analyze medical data to determine realistic rehabilitation goals for patients. Train caregivers how to provide for the needs of a patient during and after therapy. See more details at O*NET OnLine about occupational therapists. Occupational Therapists by U.S. Department of Labor, Employment and Training Administration is licensed under a Creative Commons Attribution 4.0 International License.